The real Sony "cult" camera of our time. This is a review of two cameras. The original Sony RX10 and it's updated self, the RX10ii. I bought the original RX10 when it first came out in 2013 and bought a slightly used RX10ii right after the start of this year. There are many similarities between the two cameras but there are also a few differences between them and, if you do various kinds of work, you'll want to know what those differences are and how they might apply to the kinds of projects or assignments you might use one of these two cameras for. I'll start with the usual disclaimer. I bought both of these cameras with my own funds, out of my own pocket. I am not a Sony explorer or visionary or an exploder of light. I am not a member of their professional club; I don't even know if they have one. I bought the first camera from Precision Camera and Video in Austin, Texas and, other than having shopped there for nearly 30 years, I have no connection, obligation, quid pro quo or other relationship with them and, as both these products have been on the market for a while, no one is kicking down my door trying to motivate me to type faster or say nice things about the cameras. I am writing about them because I think they are powerful tools that work well for many of the professional, commercial assignments I use them on, and I think if more people knew more about these cameras they might find that they have far more choices in the tools they can use for successful photography and video than they might currently think. In some ways I am writing this to shift the collective idea of what constitutes a "professional" camera a bit. Before we dive in let me write a quick summary of what these cameras are. For want of a better term, these are "bridge cameras." That designation was first coined to describe cameras that were more than point-and-shoots but somehow "less" than DSLRs. The basic formula is to make an all-in-one camera with a non-detachable lens that can, in many situations, take the place of bigger, traditional cameras. A substitute for a Canon Rebel or A Nikon D3x00 camera. For over a decade the cameras in this class came with long lenses and small sensors. The lenses could have a lot of magnification just because the sensor was smaller. But the lenses were not often great. Most sacrificed a bit of image quality performance for sheer range and sacrificed fast apertures (as the lenses zoomed out) for smaller package sizes. The first model to shift the parameters, and shift our thinking about bridge cameras, was also a Sony. It was a model called the R1 and it was introduced around 2005, shipped mostly in 2006. It was a different beast in that it used a much bigger imaging sensor. Almost APS-C in size! And it combined that big sensor with a very, very high quality Zeiss zoom lens that was specifically designed to get the maximum in image quality from its matched sensor. That camera came with a decent EVF and a very useful (and movable) rear screen that could even be used as a waist level viewer. While it was a contrast detect AF system, in good light it was pretty fast and it also allowed for manual focusing with image magnification. The camera shot raw but in the raw mode the buffer was painfully slow. Two shot and a freeze up for a few seconds. I ended up shooting Jpegs with mine for everything but studio still life work. The R1 was a very interesting camera but I think it never sold well. Certainly not at its introductory price of $1995. So, after a year or two on the market the camera got killed by Sony and nothing in that space came along that challenged the R1's camera technology high points or did much of anything interesting. In 2013 Sony woke me up from my bridge camera slumber by introducing the original RX10 camera. 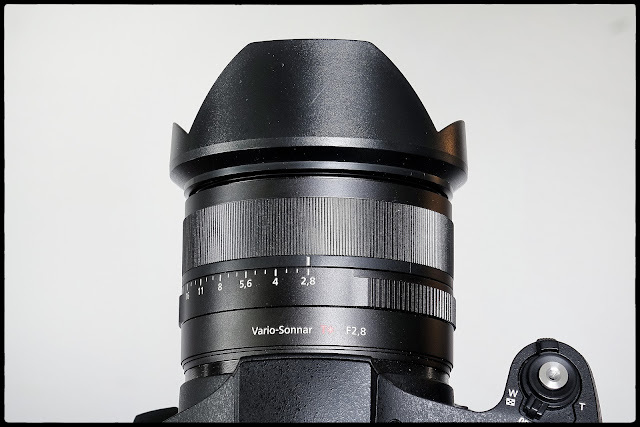 It's based around a very, very good and very low noise, one inch sensor and a really well designed and implemented Zeiss 24-200mm constant aperture, f2.8 lens. The first model has a really good EVF while the second model has a great one. But the thing that made most of us who initially wanted one sit up and take notice was it's video capabilities. In some ways I suspect that both of the RX10 cameras are just great video cameras that also take wonderful, high resolution photographs. In the best of all worlds who do I think Sony designed these cameras for? 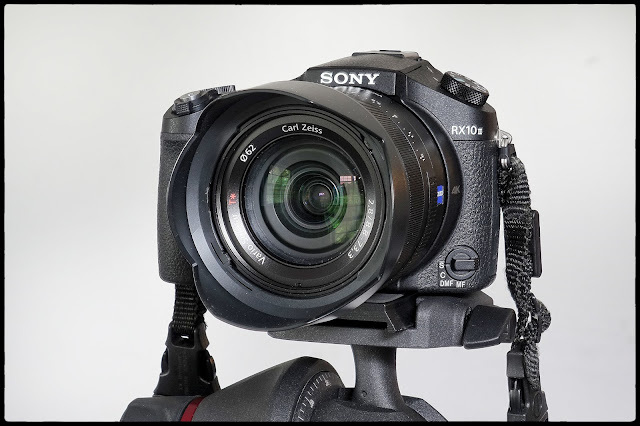 When I think about these cameras I imagine that the following discussion took place among the top camera designers and photographic thinkers at Sony. I think they looked at the overall market for photography and, for a moment, focused on professional journalists. They knew that more and more writers were being asked to take photographs for their own articles. It's always cheaper to send one person who can write well and take passable images than it is to send two salaried professionals out on the same job. The Sony designers could point to examples of dedicated photographers around the world being tossed out the doors of newspapers and multi-media content producers while the writers at the same companies were being trained to become jacks of all trades. At the same time there was also a strong shift in what had been tradition commercial (non-retail) and corporate photography. Younger photographers were blurring the lines between conventional photographic service and video production. After all the new photographers coming into the market had, in many cases, grown up comfortable with taking, and sharing, video. The designers at Sony imagined the pressures that the "new" journalist would be under. They would need a camera that could serve a one person crew. It would have to be relatively easy to operate, easy to handle and also have the capability to take video that would be good enough, technically, to be used on web channels and even local television broadcasts.